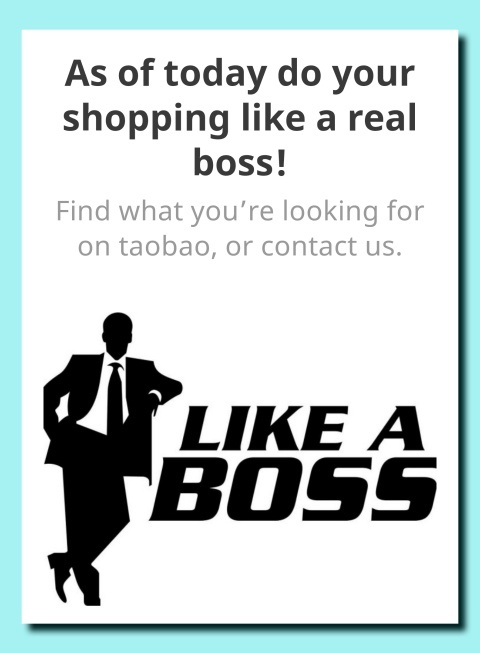 Taobao shop (which literally means the fact of searching for treasure on a website) is a Chinese website for online shopping: wholesale or for individuals, whatever. It was coined by Alibaba Group in 2003, and based in China (do you see the link between the Tales of the Arabian Nights? When Alibaba finally finds the magical and gigantic cave with all the treasures and jewels? That's it!That's the point of assimilating the magical with everyday's life.) For European people, this website can be compared or associated with other wholesales websites as Ebay and/or Amazon and lots of other. If you are an adept of Youtube videos, you can easily see people who makes kind of reviews about Aliexpress (another website, presented by Alibaba Group and similar to Taobao), if you want to form your opinion about these websites. Taobao is one of the marketplace which eases consumer-to-consumer trades, adding a platform for whether small and medium businesses or individual persons to open something which could be a sort of online store. It builds a kind of huge family and it brings together mainly Chinese-speaking consumers (Hong Kong, Taiwan, Macau, and abroad). With around 760 million of products, Taobao Marketplace is one of the world¡¯s top 10 most visited websites, generally speaking. The positive point is that sellers are able to post goods for sale either through a fixed price or auctions, and buyers are truly kings! Indeed, you can see any background (bad ou good experience that someone else could have had: ratings, comments, complaints, or whatever you could imagine, you would be reassured by this system ...). Within only two years after its creation, taobao became China's market leader thanks to the quality of goods sold, in some. Taobao marketplace had more than 5 million registered users as of June 2013 and hosted more than 80 million product listing. Talking in a more general way, the website gathers so many different items that you cannot even count them: clothes, accesories, shoes, beauty stuff, even toys or cars widget, whatever you will need, you are almost sure you will find it on it! Besides, the interface of the website is colorful, pleasant and it does not appear cheap at any moment. This is well classified in order to find anything in just a few seconds. Australia, Canada, United States, and lots of other countries, so do not hesitate and please, order! ... uhm, maybe I missed it, but ... what is the exact website to this, lil cat? ... Love, cat. LOL...it;s an online shoppin website. Name looks like toa pao, giant steamed buns... Now, that I like!!! hahahaha....maybe they will have that too. So far I only bought online from Amazon. Very long time liao never buy things online. I haven't tried this although I had a client who was very into this. Coz scared that if got problem then very hard for me to complain in Mandarin. I use local sites like lelong etc instead. Ya ya my client also very happy with it. She will gather orders from others in the office so they can save on shipping. But she knows Mandarin la so the site is not alien to her like it is to me. Thank you for introducing this website. It sounds like a great place to shop. Taobao is a very very x100 dangerous place for me, it's a kind of addiction you know =.="